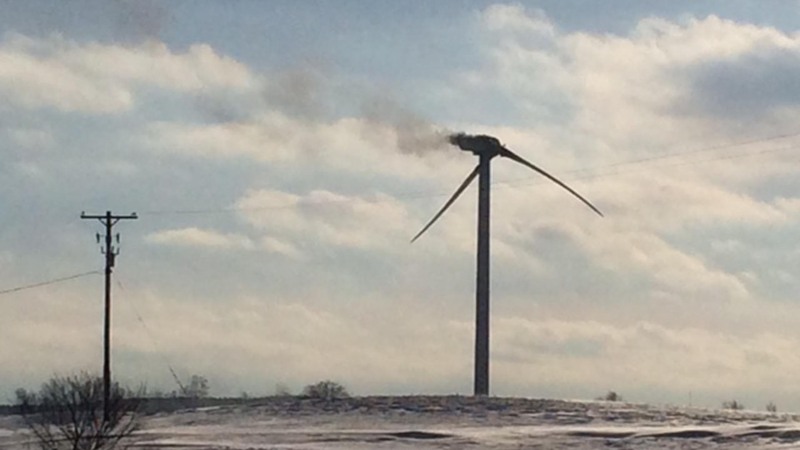 A wind turbine was absolutely destroyed Tuesday when it caught fire. Our crews were there as a massive blade came crashing off the burning turbine, slamming into the ground. Fire crews got to the fire around 1:30 Tuesday afternoon. The fire was way too high to get to, so they had to let it burn. All three blades fell off the Heritage Sustainable Energy turbine in McBain, between County Line and Lucas roads. Heritage Sustainable Energy, who owns the turbine, just got to the scene. Right now they’re trying to figure out how it started on fire. Thankfully, no one was hurt from any of the blades falling off. Firefighters at the scene also do not believe the turbine tower will fall down. Heritage Sustainable Energy says they have never had a turbine fire at this farm before, but when they place the turbines they take into account how close homes are to them. The company says that’s the biggest priority, keeping others safe. “Most importantly, safety was our number one goal to protect any personnel. There were no personnel anywhere near the wind turbine. All these machines are monitored remotely, so there was a fault at some point,” says Rick Wilson, Heritage Sustainable Energy. The flames are mostly out now, but crews are still working to keep the area safe.